The Managing Director of the Nigerian Ports Authority Hadiza Bala Usman has warned organizations in the Maritime Industry that the NPA football team fondly called Hadiza Warriors would do everything possible to retain the trophy in 2019. “Adding that though NIMASA which NPA defeated in the final 4-1 is strong this year, but NPA would even be stronger in the 2019 games”. While receiving the Maritime Cup which was delivered to her by the General Manager Human Resources and Chairman Nigerian Ports Sports Association (NIPOSA) Alhaji Yahaya Bukar at her Marina office in Lagos yesterday the MD expressed joy and happiness that the victory is important and historic especially since it was the 10th year anniversary of the competition sponsored by the Ships and Ports Media Ltd. The MD also added that the entire work force should imbibe the spirit of fair play and integrity as it would ultimately help them to grow in confidence to do greater exploit in their endeavors. 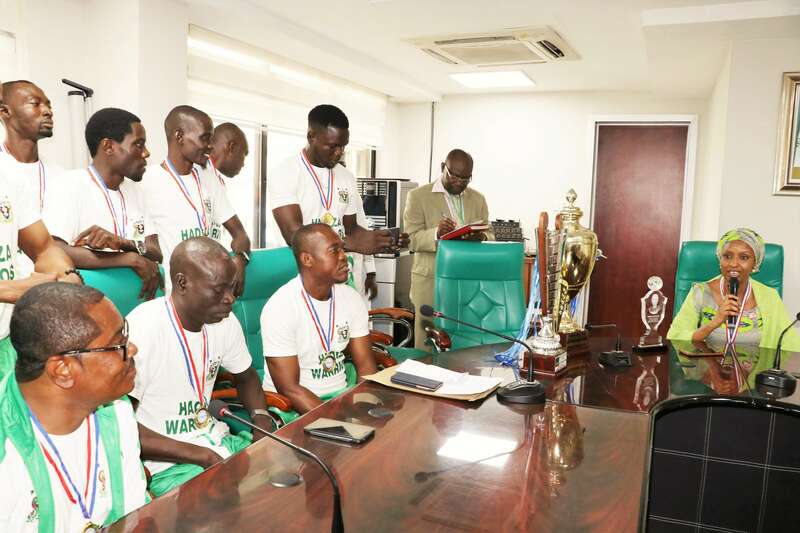 In his own view, the chairman of chairmen of sports in NPA and Principal Manager Monitoring and Regulations Mr. Charles Okaga who also doubles as Hadiza warriors team manager, was on hand to motivate the team emphasizing that it was only NPA that did not have any team protested against her players also adding that the team drew inspirations from the Managing Directors straight forwardness which she has over time inculcated into the work force of the organisation.